Happy December! Can you even get over that? I cannot. If I could have one wish, it would be to freeze time for a little bit so I could get ten million things done before going back to real-time life. That way, once in real-time life, I could feel completely put together and in control and not like a hot mess who goes to bed at 2 a.m. every night (morning?) and barely functions all day. But since that clearly won’t happen, I will continue on being a hot mess who’s already crying over the fact that the holiday season is flying by without me having enough time to prepare or enjoy any of it. At least it can be enjoyed in some small ways. 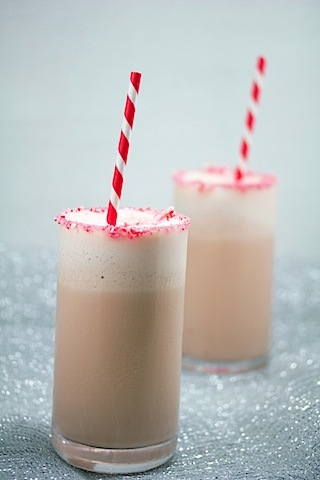 Like milkshakes packed with candy canes. Because goodness knows this is the perfect treat for Christmas tree decorating, holiday gift wrapping, Miracle on 34th Street watching, and just all around decking the halls in between. Even if do happen to be sipping on it at 2 a.m. Le sigh. ‘Tis the season to be jolly! First you’ll want to crush those candy canes. You can do this by putting them in a plastic bag and pounding on them with books, hammers, meat mallets, etc. 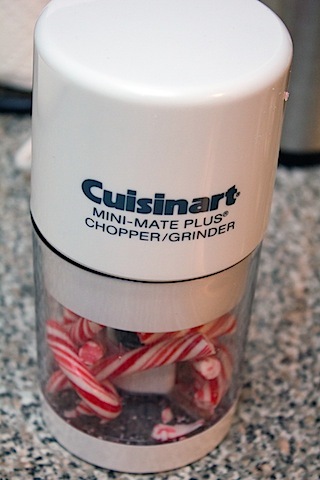 Of you can use a tool like the Cuisinart Mini Chopper like me. I’ve had one of these forever and burned it out earlier this year. I was seriously sad until I got a new one for my birthday! This was my first time using my brand new one. In fact, I’m an idiot and didn’t remove the rubber stoppers on the blades before using it (they were clear and I didn’t notice them!). But somehow, my candy cones got chopped just gloriously. I have no idea how that worked. But it did. 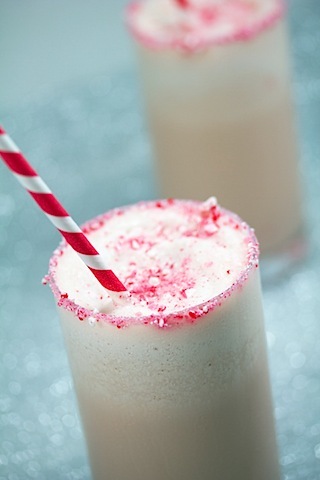 In a blender combine ice cream, milk, most of the crushed candy cane (leaving enough to rim and garnish two glasses), malted milk powder, and peppermint extract. Rim your glasses with crushed candy cane (I used a simple syrup to get mine to stick… You can use anything- maple syrup, honey, etc.). 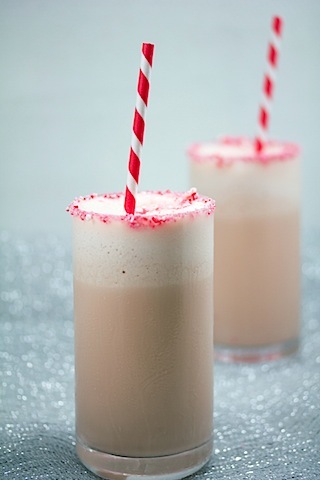 Pour your milkshake into the glass, sprinkle a little more crushed candy cane on top, and enjoy! This was the perfect seasonal delight!. It was just the right amount of minty and had just a touch of malted flavor to it. 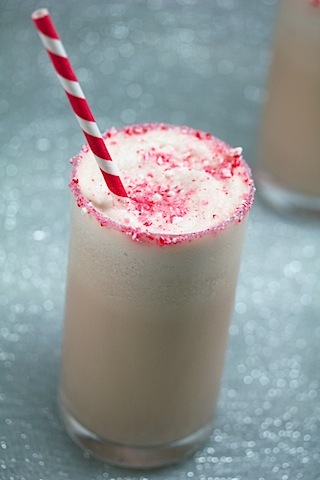 I should mention that I’ve been wanting to make a malted milkshake for some time now (with crushed malt ball on the rim! ), but then I started craving peppermint… And the rest is history! I feel like this is the sort of thing if you left for Santa instead of plain old milk, he’d be perfectly happy. But he’d probably have to fight other members of the household off for it. So, make extras. In fact, I feel like this milkshake is enough to get the Grinch in the spirit! I whipped this up on Saturday night after going out to dinner and getting ready to settle in on the couch and watch Brave. Which was a good Disney movie, but certainly not my favorite. I know it’s not at all a holiday movie, but this milkshake helped give the evening a bit of a more festive feel. As did the 25 degree weather and snowy morning. There are about a million more things I want to do with candy canes before the season is over, which is why I need at least 60 more days in the holiday season. Can we make that happen? Or can we make candy canes socially acceptable in March? There’s one candy we haven’t seen cross over into other holidays (unlike Peeps, Cadbury Eggs, etc.). At least I feel in much more of a celebratory holiday-like mood. Another thing getting me in the holiday-spirit? Writing my annual holiday gift guide for food lovers! It’s in full swing and should be coming out soon, so get ready. Have you started celebrating the holidays yet? How so? 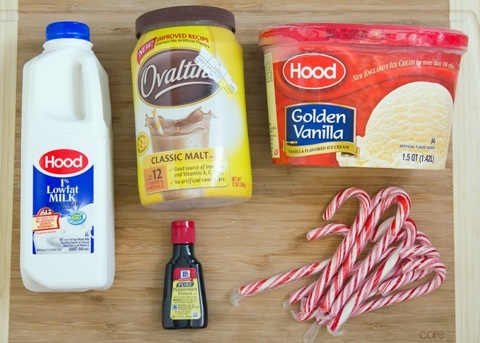 17 Responses to "Malted Candy Cane Milkshake"
seasonal drinks like this make me a little bit happier that we’re in december- what a fun idea! 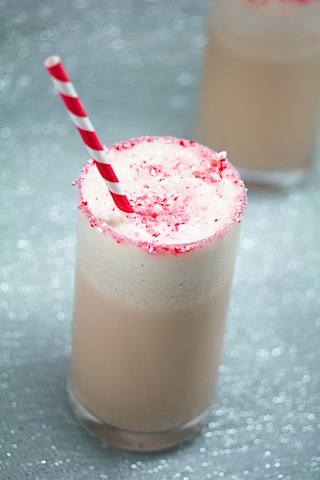 This is so festive and adorable, I especially love the candy cane rimmed glass, such a great idea! I am totally with you! Let’s freeze time, catch up on our to-do lists, then start time again so we can be on top of things and able to enjoy the holiday. But I suppose it isn’t Christmas/New Years without a bit of panicked rushing… But I hope you are able to enjoy it, whether everything is done or not! 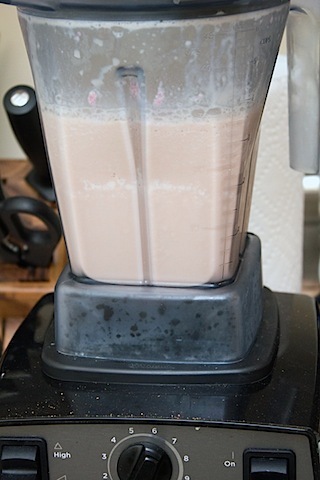 This milkshake looks so, so good. 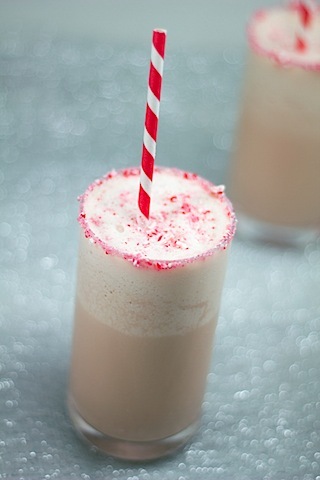 I love peppermint, I love malt powder, and I love milkshakes! I think I could even get Eric to enjoy it, ha! Hello! How cute is this?? Makes me want to take a trip to the North Pole and hang out with some penguins. 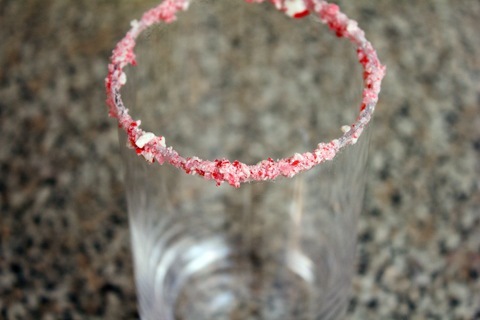 The candy cane rim is perfect!!! If you sugar a rim, i will likely attack it. I love sugared rims! This is gorgeous too! perfect for the season! I have actually cut myself trying to chop up candy cane and have also found that pieces tend to fly everywhere (unfortunately ants find the sweet treats on the floor later ugh!). So I’m very jealous of your Cuisinart mini chopper. Although I’m not sure I would use it for anything other than candy cane! Ha. This recipe looks amazing! You guys are really inventive. This looks great! And I plan to decorate our home for Christmas and Hanukkah this evening. I feel that way about the holidays too… they are going to be gone before I get a chance to relax and celebrate them. 🙁 This is a great holiday treat though… I especially love the crushed candy cane on the rim. That is seriously the cutet milkshake ever!!!! 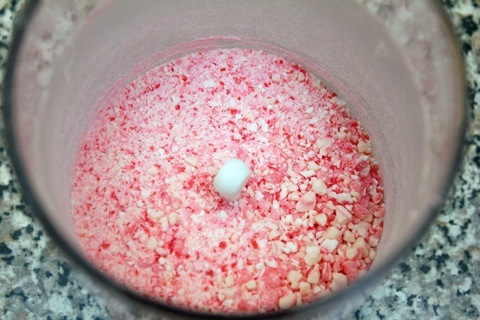 It’s a peppermint dream! I love any and all things peppermint this time of year. love this. i want one tonight! !